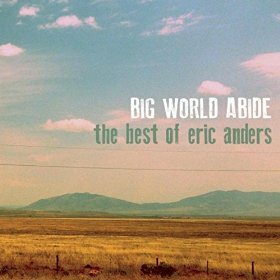 Eric Anders is a contemplative, moody, inward directed singer-songwriter who, in the great pop tradition of songsters, mulls over, muses and meditates intensely over matters in their life that haven’t unfolded anywhere near their liking. It’s not an easy job, if you think to consider that this sort of scribe is required to condense a slew of contradictory reactions and response to a few basic chords and (preferably) terse, rhyming couplets embracing a rush of emotions and coming up a tune that has a hook, is lyrically provocative, is hummable, and is not “talked to death” as a meditation on one’s misreading of how the universe around actually works. Anders avoids the chatty, overcompensating rationalization of lyrics that are fewer words to glide on the melody than they are probes into intangible topics. Anders, who vocally reminds of Cold Play singer and guitarist Chris Martin with his appealing, fragile falsetto delicately crooning the fragmented lyrics, understands the value of brevity, of creating the effect, the mood, and then moving on to the next investigation of inchoate pondering. BigWord:The Best of Eric Anders, a collection of songs from his previous four releases, shows us a singer who has solid, if limited, sense of how to put a tune together, how to create the arrangement and instrumentation that gives the simple structure an evocative embrace, and lyrics that are segmented impressions, depths of private consideration and yet are still aware of the politics, the injustice, the hard facts of history and lessons a larger culture hasn’t learned. There is something in this collection that makes me think of a personal journal, notebook jottings, brief and pungent images, allusions and references set to an effectively arranged music backdrop. It’s not a matter the lyrics make literal sense, that they are genuinely “poetic” that the fussier rock and pop critics require ; although cryptic, non-contiguous with regard to formal argument, there is a streaming, plain-spoken private language here that creates the feeling that you’ve walked into a room you assumed was empty only to discover the lone likes of Anders alone, standing at the window, talking to himself as speaks to a grove of leafless trees (or a garden in full bloom, for that matter). There’s the sneaking suspicion that you’re intruding, but the words you make out, the tangible phrases you make out are fascinating in their isolated resonance. You lean closer to hear more, you make the connections you’re able to, and you leave, understanding only a little, intrigued all the same. To that end, Anders reminds me of the later work of the late singer-songwriter Phil Ochs, a contemporary of Bob Dylan from the folk music protest music of the sixties. Late in his career Ochs turned away from being a polemicist for the New Left and authored a series of albums like Tape from California and Rehearsals for Retirement in which is poetic gifts as a wordsmith explored his disillusionment with the counterculture and its promise of creating an America based on the ideal of peace, freedom, and justice. The work was oftentimes brilliant, the grand sounds of someone caught in a spiral of clarity remindful of Lear, someone being buffered by an onslaught of truth under the appearance of things and the errant reasoning that makes them appear substantial. Ochs took it hard and didn’t survive the spiral he was caught in. Anders gives me the feeling that he will walk through the contradictions. He hasn’t Ochs’ genius for poetic lyrics, but it may well be that’s a benefit to both his personal resilience to life’s hardscrabble and to his music. Even though the songs on Big World Abide would have been better if there were a broader spread of tempos and styles — by the end of the disc one feels like they’ve been on a very long car ride on the turnpike between Detroit and Cleveland at a constant, deliberate speed, the bump and hiss of the tires lulling you into an unpleasant stupor — what makes this record remarkable is the sense that Anders is weighing his options as to how he wants to live his life. He seems a man willing to examine his mistakes and his disillusions and disappointments and to learn, demonstrating an ability to change based on new evidence. That is appealing indeed.